Make your next table top adventure incredible! The Dungeon Lair gaming environments can be used with most table top fantasy games. So, we have been getting a lot of requests for the bookshelves and larger rooms. So we went ahead and listened to what you guys had to say. We appreciate everyone's excitement and interest, but more importantly your patience with us as we work through our campaign. We think you will be happy with what we have settled on. We are going to add another pledge, but only one more. This is for the new Advanced Starter set. 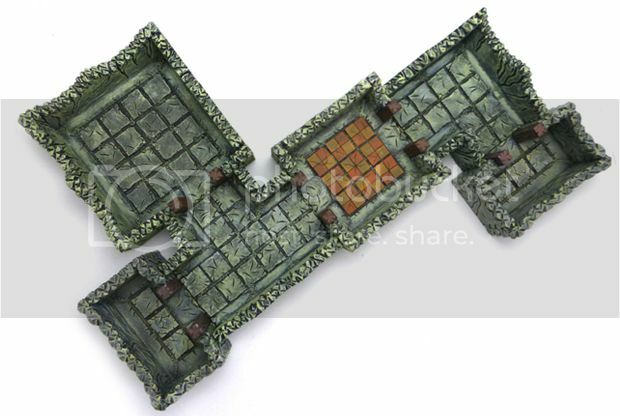 This is the starter set we will be making available for sale on our website and does a better job of showing off what you can expect as you expand your dungeon! It includes a 16 tile room as well as two passageways pieces and a colored tile room! (only orange is available at this time, see the pictures for details). The pledge will be for a single copy of the set only, but we will be offering the new set as an Add-on for any of the other pledges! We will get to that in a sec. We are also going to be offering the bookshelves, not as a pledge, but as an Add-on. We are offering a set of 4, (2) Tall shelves and (2) short. So here is how it will work. You can add as many of the sets as you would like, just add the following dollar amounts to your pledge and message us the breakdown of what sets you want added and as long as your math adds up, we will process the order! International Buyers - Your initial shipping should cover most Add-ons but if you plan on adding more than 2 Starter or Advanced Sets, please let us know so we can make sure. We hope this is more of what you are looking for! Remember to tell your friends! None of us get what we want unless we reach our goal, and if we can reach our stretch goal, you guys are going to be really pleased with what you can create! Thanks for all the support and feedback, it didn't fall on deaf ears! Daniel - Thank you for your support! Don E - Yes, when awesomeness meets awesome. That pretty much explains how we came up with this update. You have no idea Don, how excited we are to get the modular rooms going. Once this is successful that's exactly what is coming next. Becky - We are happy that you like it! Ross - Your postage should be fine, and yes you can change from the Starter Set to the Advanced Starter set. Please make note of that so we don't get confused on our end. Thanks! Brian - Thanks for you support! When awesomeness meets awesome, very excited good call chief. Looking forward to the Modular pieces as well :) all in good time of course. I have pledged for the 2 starter dungeons with postage. What would be the postage with adding the advance dungeons? As well is it possible to change a standard starter dungeon to a advance dungeon? Just what I wanted! 2 sets of bookshelves added in.